In the late 1800’s and early 1900’s life could be difficult in Northern Finland. I was told that my grandfather Mehtala made tar, and charcoal from the wood the tar was extracted from. That was a thriving business in Finland; wooden ships built in England needed tar to caulk seams. Finland sent what was needed via a vast network of waterways, in our case from Oulu, up north a little west of Haapavesi. My Finnish grandparents lived in a small log house in a village near there, grew whatever they could and had one or two cows and pigs. They hunted game, mushrooms, berries, in the forest and fished in the lake. My grandparents had nine children – the last in 1901 when my grandmother was almost 49. Sadly, the youngest, Hilja, died of TB, “blind and unmarried”, when she was 34. Grandma survived her by a couple of years and then also died of TB, but these later sad events happened in the 1930’s. Returning to 1900: The New World beckoned. Sophy, the eldest, quite enterprising, emigrated first – perhaps with sister Ida. Sophy was married in Fort Bragg in 1902 according to the local paper. Her husband was an American-born son of Finnish immigrants who worked cutting down trees. Logging camps advertised for skilled woodsmen in European newspapers. The coast redwoods could be more than 20 feet across; the cross-cut saws had to be welded together to make blades long enough to do the job. It was hard, dangerous work. Women were wanted too, to become wives for the immigrant men. There was work for women, too. Sophy sent for Uncle John in 1903 and a few years later he collected Uncle Andrew from Haapavesi two months before Andrew’s 19th birthday. 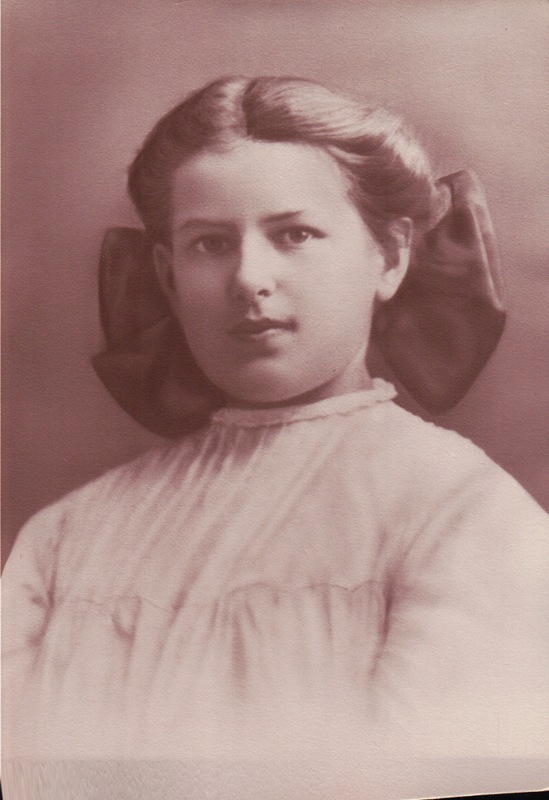 Sophy worked hard cooking in the logging camps; she was also a healer and a midwife – she even owned a home health care book, in Finnish, published in London, 1908. Mama didn’t like the obligatory physical examination at Ellis Island: remember she was 12 . But she and Tillie passed muster and boarded a train for San Francisco with what little luggage they had and the tags with name and destination around their necks. Neither spoke a word of English. From San Francisco they traveled north by train to Willits and then rode a stage coach to Fort Bragg in Mendocino County where Sister Ida lived. Mama said she and Sophy, fifteen years older, didn’t get along very well, so when Mama was 14, she and Tillie traveled to Los Angeles, looking for work. Mother’s job was as a “mother’s helper” for a family with two little boys. Mrs. Hine taught Mother English in the evenings after the boys were in bed. The couple wanted to adopt her, but after some thought, Jennie decided she was too old, so it didn’t happen. Mama and her first husband were married in 1909. She stated she was 16 but was actually 15 1/2! I can’t help wondering what her husband thought when he learned her real age. He was 7 or 8 years older. He was an American, whose forebears didn’t come from Finland, an assayer and later mine manager and part-owner of the biggest gold mine in Arizona. Eventually, they had six children. Mother went to California to deliver some of the babies as sisters Sophy and Tillie were midwives; also, her “summer babies” were more safely born out of the Arizona heat. In October 1929, the same month the stock market crashed, Mama (Jennie) was widowed. Her husband had fallen ill and doctors couldn’t save him. She was 35 years old and left with very little money and five surviving children. They said good bye to Arizona friends and the family graves. They drove to Humboldt County, California where Sophy and Tillie were living. Several of the kids were teen-agers who got jobs to help Mother through the Depression years. Within a few years they all moved back to Mendocino County – including Sophy and Tillie, both with second husbands. Eventually, Mother (Jennie) met my dad, whose parents had emigrated from Finland before 1885, and who had met and married also, in Fort Bragg. Dad said he remembered Mother when she first arrived there with Tillie. He thought she was the most beautiful little girl he’d ever seen. She was 12, to his 19, then. I was born, like Dad, in Fort Bragg, 28 years after that first meeting! This family story is shared by Palo Alto resident, Jan Curtis, the daughter of Jennie.